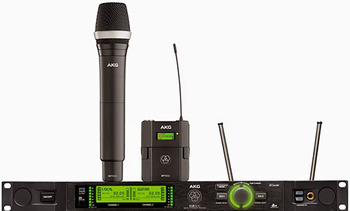 ANAHEIM, California – HARMAN’s AKG is introducing the DMS800 reference digital wireless microphone system. Building on the incredibly successful DMS700 V2, the new DMS800 offers everything that made its predecessor an outstanding performer, while adding features that deliver more versatility than ever before. The DMS800 features two digital audio outputs for DANTE and AES EBU, along with improved design and mechanics for the DHT800 handheld transmitter, plus interchangeable microphone heads. In addition to the DHT800 transmitter, the DMS800 system includes the DSR800 stationary receiver and the DPT800 wireless body pack transmitter. The system offers two balanced XLR and two unbalanced jack connectors, as well as digital wireless audio transmission with low-cut filter, 3-band equalizer, dbx compressor and dbx limiter. The DMS800 allows users to choose from a variety of premium dynamic and condenser vocal microphones, including the D5 WL1, D7 WL1 and C5 WL1. Up to 40 channels are available with the DMS800, which can be used simultaneously. High-end antenna system and multichannel accessories are available to suit the system to individual needs. Built-in HARMAN HiQnet™ network remote control and monitoring can be done from a PC via HiQnet Audio Architect™ software, Apple iPhone/iPad/iPod® or Soundcraft Vi Series consoles. The DMS800 boasts an up to 150MHz ultra-wide frequency range, making it ideal for worldwide touring in frequency-crowded environments. Also, 512-bit encryption ensures state-of-the-art protection for sensitive audio information.